Ministry of Defense of the Republic of Kazakhstan is a central executive body which carries out state policy in defense sphere, and manages the Armed Forces of the Republic of Kazakhstan. The Ministry carries out its activities in accordance with the Constitution and laws of the Republic of Kazakhstan, acts of President and the Government of the Republic of Kazakhstan, other normative and legal act as well as this Regulation. The Ministry is an entity in the legal form of a state institution, it has seals with image of the State Emblem of the Republic of Kazakhstan and stamps with its name in the state language, letterheads of the established form. It also has accounts in banks in compliance with the legislation. The Ministry may enter into civil-law relations on its behalf. The Ministry has a right to act as a party of civil-law relations on behalf of the state, if it is authorized for it in compliance with the legislation of the Republic of Kazakhstan. The Ministry within its competence in the established order issues acts in form of orders and directions which have a binding force for the whole personnel of the Armed Forces. In May 1992 the Armed Forces of the Republic of Kazakstan and a Defense Ministry were proclaimed. Kazakstan was unique among the post-Soviet Central Asian states in that a distinguished Kazak existed to become the first Defense Minister; General Sagadat Nurmagambetov, Hero of the Soviet Union during World War II and former division commander, had attended the short course of the General Staff College. His deputy defense ministers were experienced Russian officers, soon joined by bright young Kazak colonels promoted to general rank. Elderly General Nurmagambetov was replaced as Defense Minister in October 1995 by 41-year old Lieutenant General Ailibek Kasymov, a graduate of the Frunze Academy and former Chief of Staff of the 40th Army, who had served since November 1992 as Chief of the Main Staff. The armed forces established in 1992 are subordinate to the Ministry of Defense and to the president in his capacities as commander in chief and chairman of the National Security Council. The second-ranking military office is chief of the General Staff. The General Staff consists of deputy defense ministers for personnel, ground forces, air defense, and airborne forces. The president's main advisory body for national defense is the National Security Council, which includes the prime minister, the first deputy prime minister, the minister of foreign affairs, the chairman of the Committee for Defense of the Constitution, the chairman of the State Committee for Emergency Situations, the minister of defense, the commander of the Border Troops, the commander of the ground forces, and the minister of internal affairs. On 07 May 2003 the President of the Republic of Kazakhstan N.A. Nazarbaev issued a Decree “On measures on further improvement of the Armed Forces structure”. Taking it as a ground, the Armed Forces had proceeded to three type basis: Land forces, Air Defense Forces, Military-naval forces. For a time, Kazakstani military forces included Ground Forces, Air Forces, Air Defense Forces, Naval units, and the Republican Guard. The CIA reported Kazakhstan Armed Forces consisting of Ground Forces, Navy, Air Mobile Forces, Air Defense Forces as of 2010. President of Kazakhstan signed a decree as of 12 July 2012 "On measures for further improvement of the structure of the Armed Forces of Kazakhstan" to approve the new force structure, the Office of the Chief Military Prosecutor said. According to the decree, the Supreme High Command General Headquarters is determined as the high politico-military command of the Armed Forces. The force structure is as follows: Supreme High Command, bodies of military administration, services of the Armed Forces, Special Troops, and Logistics Services of the Armed Forces, military training schools and military-scientific institutions. Bodies of military administration are divided into: strategic, operational-strategic, strategic-tactical, tactical, local. The decree came into effect from the date of its signature. On 16 February 2003 the Supreme Commander-in-Chief of the Armed Forces N.A. Nazarbayev put the task on further modernization of military office structure, differentiation of functions of the Ministry of defense and General Staff of the Armed Forces of the Republic of Kazakhstan. As the result of the conducted activities there was created Joint Chief of Staff on the base of General Staff. Joint Chiefs of Staffs began fulfilling tasks connected with managing by the Armed Forces, their routine life, operative-strategic planning and battle training of troops. On 07 May 2003 the President of the Republic of Kazakhstan N.A. Nazarbaev issued a Decree “On measures on further improvement of the Armed Forces structure”. There was created a new strategic managerial body – Joint Chiefs of Staff. 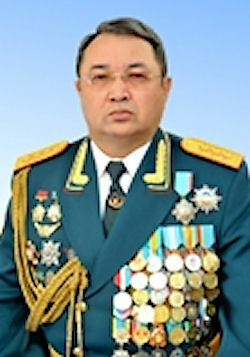 Colonel Bulat Kerimzhanovich Darbekov was appointed as chief of this new managerial body. The First deputy Minister of Defense is the Chief of General Staff of the Armed Forces of the Republic of Kazakhstan. In April 2009 by Decree of the Head of State Colonel General Zhasuzakov Saken Adilkhanovich was appointed Commander-in-Chief of Land Forces of the Armed Forces of the Republic of Kazakhstan. From March 2010 to January 22, 2013 he held post of the first deputy Minister of Defense - Chairman of Joint Chiefs of Staffs of the Ministry of Defense of the Republic of Kazakhstan. On January 22, 2013 by Decree of the President of the Republic of Kazakhstan he was appointed the first deputy Minister of Defense - Chief of General Staff of the Armed Forces of the Republic of Kazakhstan. After September 11th, 2001, the Kazakh attitude toward reform of the Armed Forces changed greatly. General Mukhtar Altynbaev was reappointed to the post of Defense Minister. Altynbaev was a staunch promoter of Armed Forces reform. Under Altynbaev, the Kazakh Armed Forces began to experience rapid transformation at the upper levels. This transformation was heavily influenced by the Kazakh Armed Forces exposure to NATO. This transformation included transitioning to a three branch military with a Ground Forces (branch), Air Force, and newly established Navy. A new entity was formed in the Kazakh Armed Forces, known as the “Airmobile Forces,” a structure with no basis on Soviet/Russian doctrine that was intended to be more interoperable with NATO. Other major reforms included converting from the Soviet/Russian command structure of military districts into a joint regional command structure. In the Soviet/Russian military district system all units of the Ministry of Defense would be placed under one commander, but the military and paramilitary units of other Ministries in the area would fall under different chains of Command. Under the new system all military and paramilitary units (with some exceptions) would be placed under one commander, the intent being for better command and control. This system is very similar to the US Major Command (MACOM) model for controlling the US military, which was likely a model for development of the Kazakh system. The MOD remains an under-funded ministry that has no policy-making authority. The simple fact is that the U.S. DOD-Kazakhstani MOD relationship is not one of equals. DOD has significant policy input in the USG, while the MOD appears to have almost none. In short, the Kazakhstani MOD is a supporting ministry, taking its direction from higher levels within the government. The United States has, on a number of occasions, successfully achieved its bilateral and regional goals by appealing to those closer to the center of power and using them to provide the MOD with marching orders.